For Christmas I gave my dad a #1 DAD bookmark and a case for his palm pilot. I had a really hard time deciding what to make him. I was thinking about making a case for his new reading glasses, but the cheap one he has will provide much more protection than a crocheted case will have. I also thought about sewing him a hand-warmer out of fleece for when he goes hunting, but I didn't get enough time to get it done. 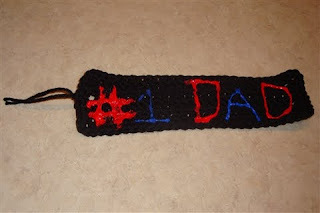 The bookmark was really simple - I just made a rectangle using double crochet, and used red and blue fabric paint to paint #1 DAD. 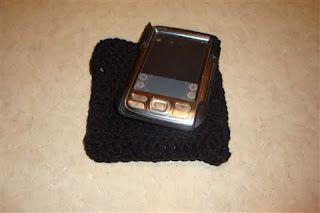 The case was also very simple - it is all double crochet and I stitched the sides together.